River Lea - The Grand Island Historical Society restored and maintains the farm house known as River Lea and located in Beaver Island State Park. It was built on Lewis F. Allen's property, Allenton Farms, by his son, W. Cleveland Allen. Today it is owned by New York State. 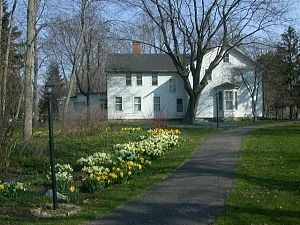 The Grand Island Historical Society will host an Open House at the River Lea Museum in Beaver Island State Park on Sunday, April 14th from 2:00 p.m. - 4:00 p.m. Everyone is welcome to attend. GI Historical Society April general meeting and program. Thursday, April 4th at 7:00 p.m. Program: Jay Englert and "A Cold Day Alaska Adventure." Everyone welcome, refreshments served. GI Historical Society March general meeting and program. Thursday, March 7th at 7:00 p.m. Program: "Allan Herschell and the North Tonawanda Carousels. "Everyone welcome, refreshments served. The Grand Island Historical Society is having a class in "Grand Island History" at the Spring 2019 Community Education Program. This is the third year a class has been held. 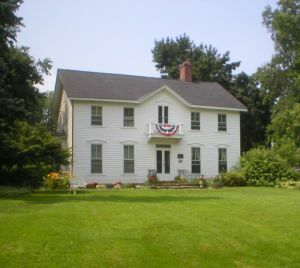 The course consists of four classes at Grand Island High School and the final class is held at the Historical Society's museum, River Lea, in Beaver Island Park. Each class has covered different subjects, so prior attendence is not necessary. This year's subjects will be Islands of the upper Niagara River, Farming on Grand Island and Resorts from the Golden Age. The classes are held on Wednesday evenings, starting March 13th, from 7:00 p.m. - 8:30 p.m. The cost is $25 and space is available. Call 773-8864 or register online here. Course Description.